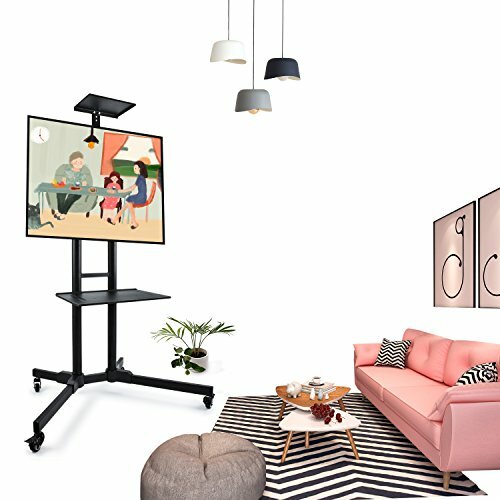 Cart can be used in conference rooms, expos, trade shows, hospitals, classrooms, lecture halls, hotels, bars, gyms, this TV Cart is often used at homes, avoid putting holes into your walls. You can roll it from one room to another or roll it outside to your porch, pool, or backyard. Our item can hold up to 110 lbs. However, the weight of TV and VESA pattern determine compatibility. Please kindly check your TV's weight and VESA pattern then buy with confidence. Designed to universally fit most LED, LCD, Plasma TVs and other flat panel displays from 32" to 65". Fits for standard VESA patterns installed in almost all flat screen TVs with a range of 200mm x 200mm up to 600mm x 400mm. TV height is adjustable from 43.3" to 60" (From floor to center of your TV) in 4 inch's increments; 5 height levels adjustment. Item comes with 2 height adjustable media Steel shelves . Top one supports 11 lbs, lower one supports 22 lbs. Comes with a roll of Velcro to tie cables together, making the back of stand neatly. No need of bothering to put wires through the inner poles or worrying about wires are not long enough. [10 Years Warranty!!] It also come with a roll of Velcro for cable management. Please feel free to contact us, if you have any problem, we are happy to help! If you have any questions about this product by Health Line Products, contact us by completing and submitting the form below. If you are looking for a specif part number, please include it with your message.